The industrial arts work shop is provided with all the essential tools and equipment to complete various projects. The east side shows the main entrance with the classroom wing on the right and cafeteria / gymnasium on the left. The east entry into the cafeteria adjacent to the main entry and student drop-off area. Instead of hiding components such as boiler flues and mechanical louvers, they are used to create other interesting forms of the building. This image depicts the main entrance and curved masonry wall of the music room. In both images, the use of solar screens and changes in materials is evident and continued throughout the school. Interior view of main corridor. The raised ceiling space provides a number of clerestory windows that allow light into the corridor. This is an image of the art room. Natural light, high ceilings, and openness provide a great atmosphere for creativity. The large tack boards allows students to display and view thier work. As one of Gypsum’s two new schools, the middle school site offers the students local mountain vistas. The 80,000 s.f. 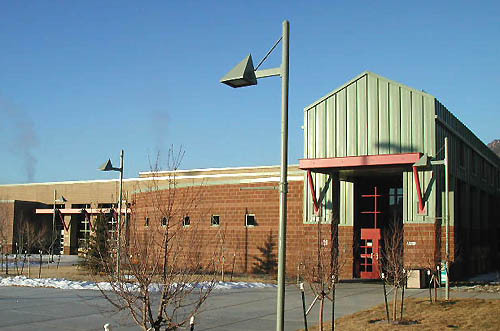 school is designed to compliment the area and also provide the Eagle County School District with a prototype design for future middle schools.